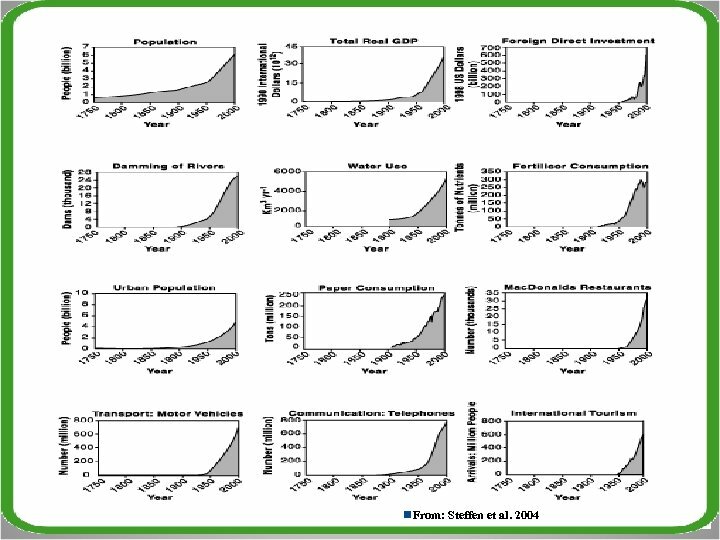 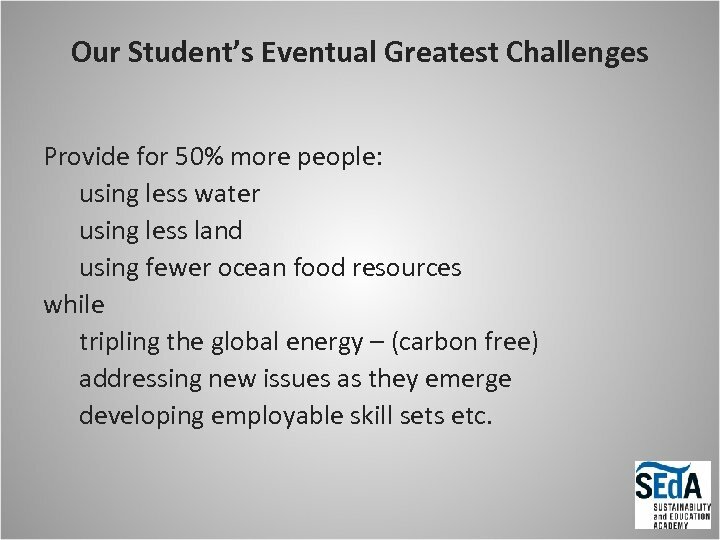 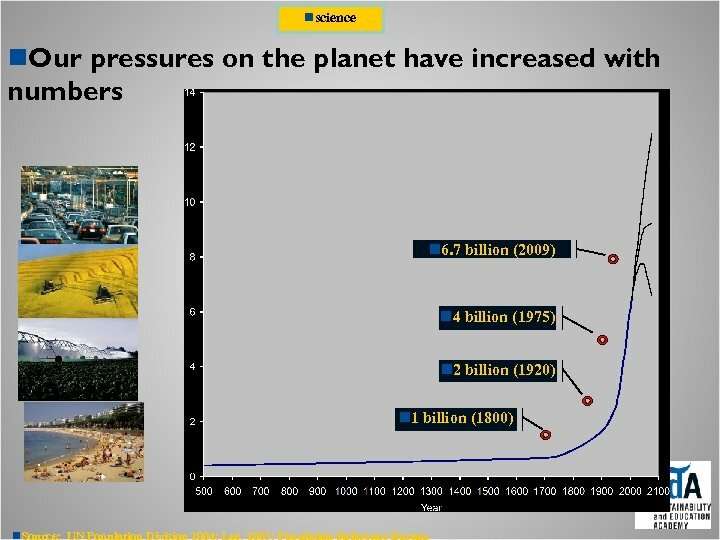 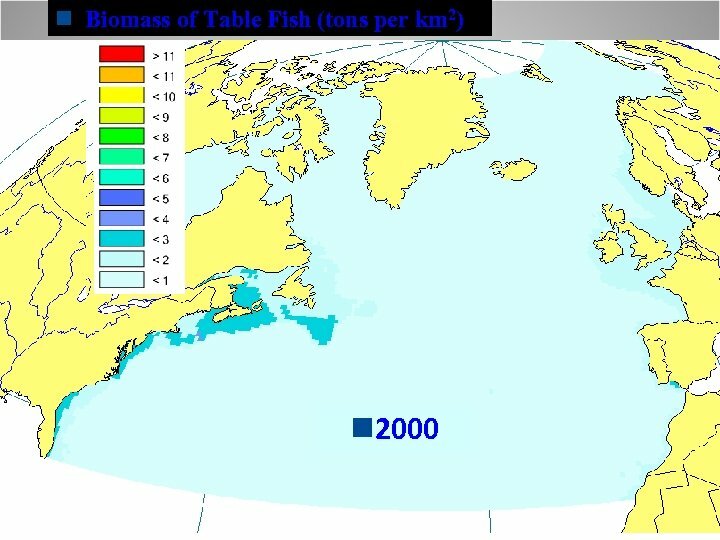 Our Student’s Eventual Greatest Challenges Provide for 50% more people: using less water using less land using fewer ocean food resources while tripling the global energy – (carbon free) addressing new issues as they emerge developing employable skill sets etc. 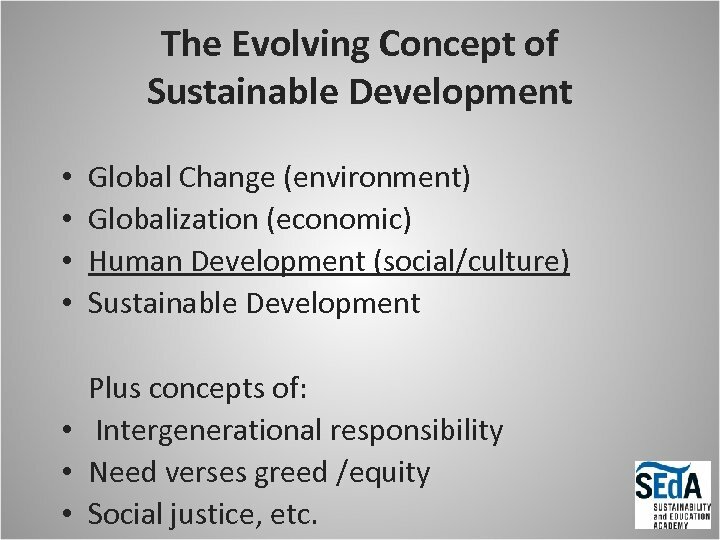 The Evolving Concept of Sustainable Development • • Global Change (environment) Globalization (economic) Human Development (social/culture) Sustainable Development Plus concepts of: • Intergenerational responsibility • Need verses greed /equity • Social justice, etc. 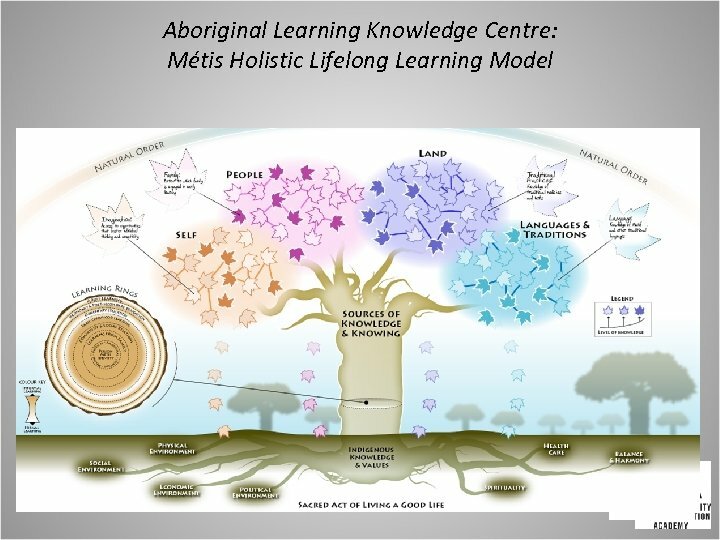 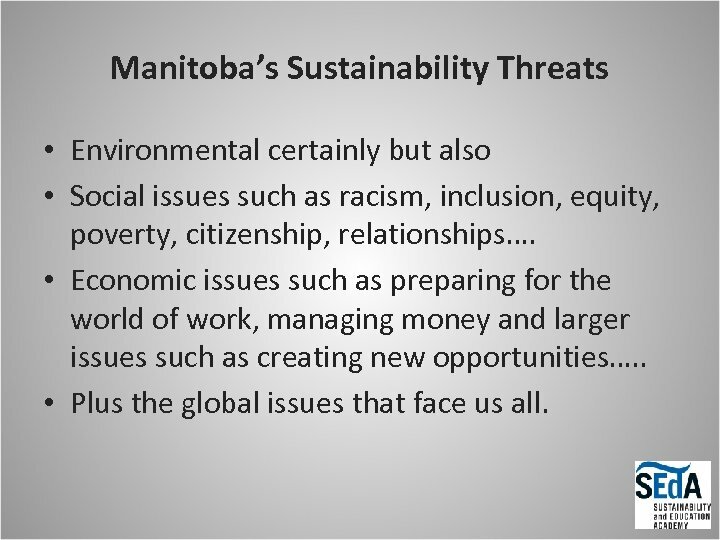 Manitoba’s Sustainability Threats • Environmental certainly but also • Social issues such as racism, inclusion, equity, poverty, citizenship, relationships…. 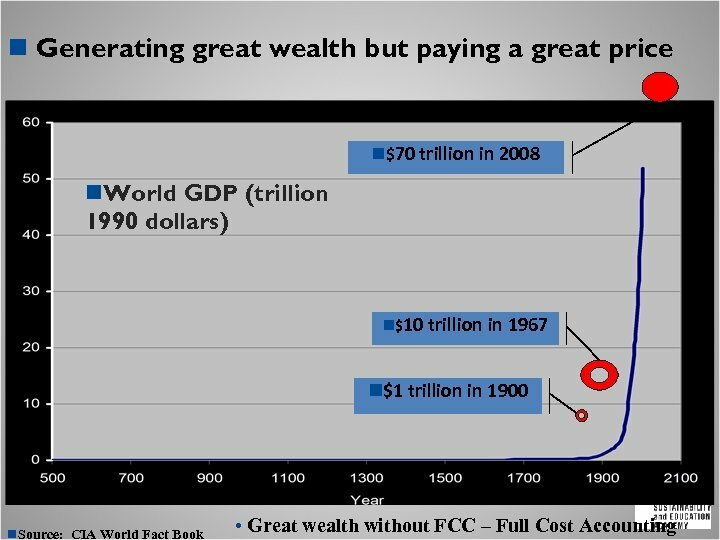 • Economic issues such as preparing for the world of work, managing money and larger issues such as creating new opportunities…. . • Plus the global issues that face us all. 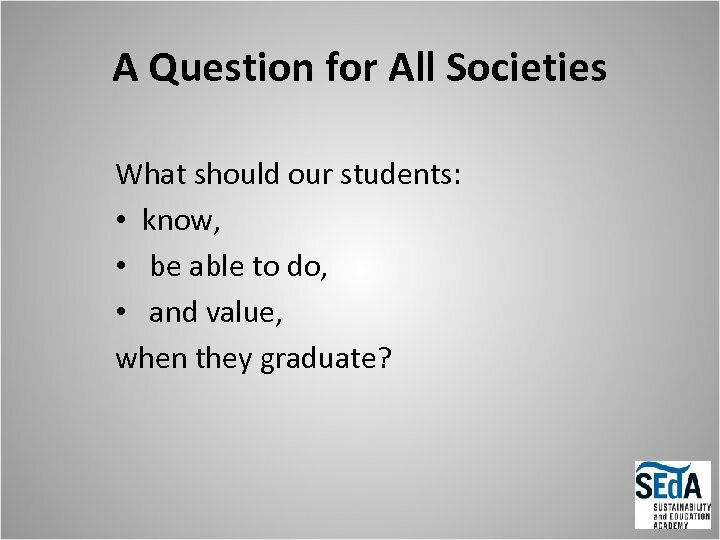 A Question for All Societies What should our students: • know, • be able to do, • and value, when they graduate? 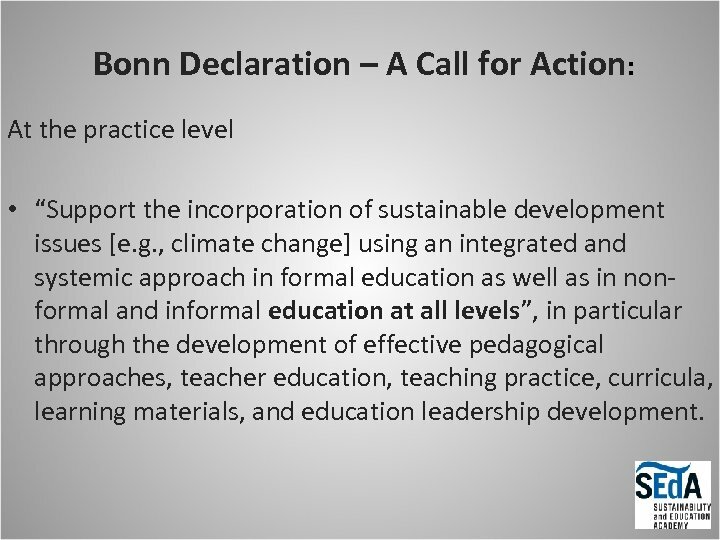 Bonn Declaration – A Call for Action: At the practice level • “Support the incorporation of sustainable development issues [e. g. , climate change] using an integrated and systemic approach in formal education as well as in nonformal and informal education at all levels”, in particular through the development of effective pedagogical approaches, teacher education, teaching practice, curricula, learning materials, and education leadership development. 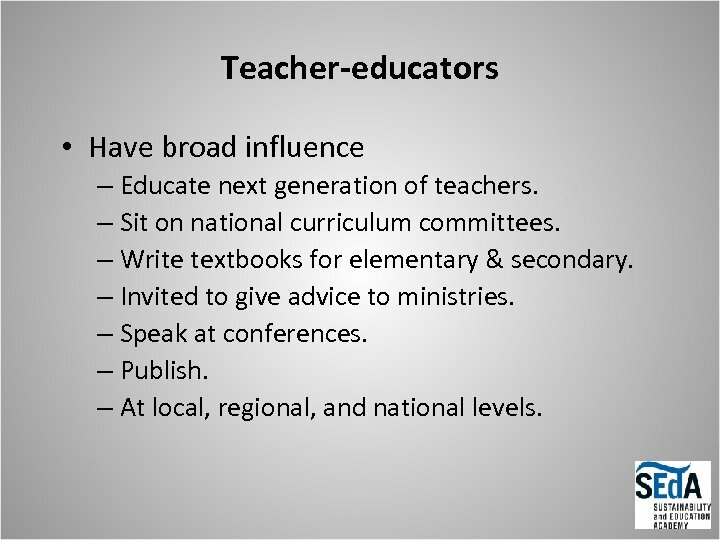 Teacher-educators • Have broad influence – Educate next generation of teachers. 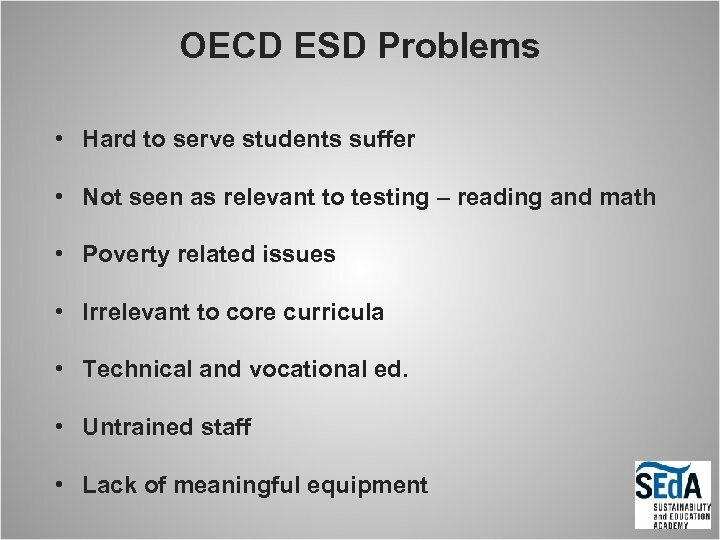 – Sit on national curriculum committees. 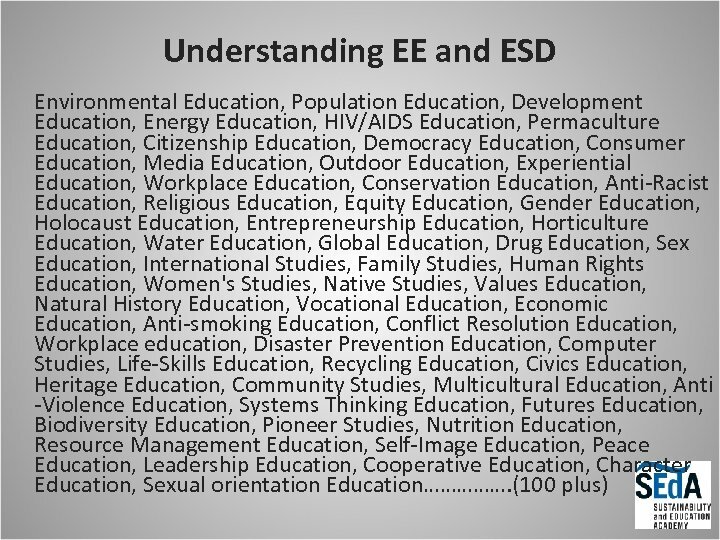 – Write textbooks for elementary & secondary. 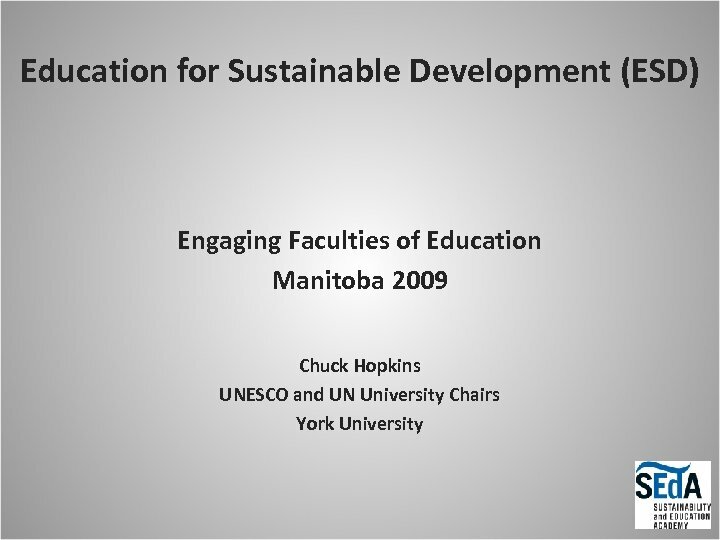 – Invited to give advice to ministries. 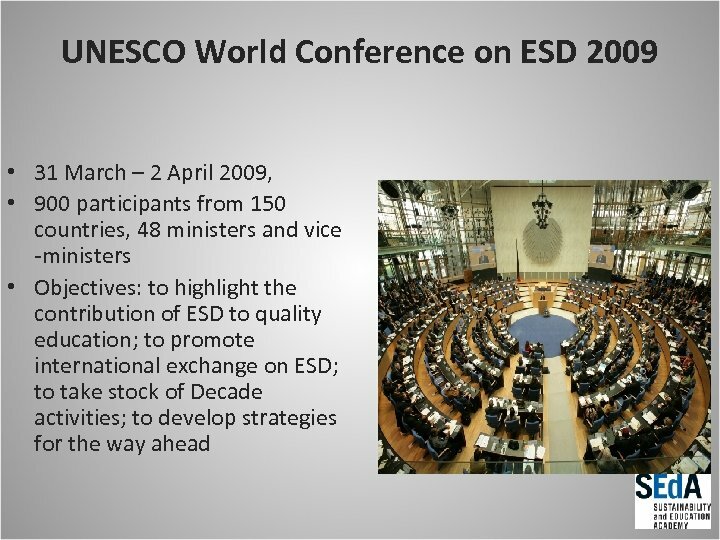 – Speak at conferences. 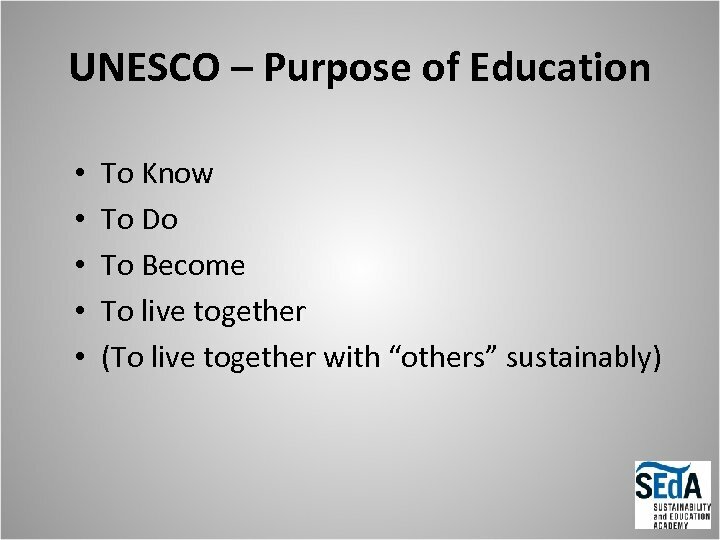 – Publish. 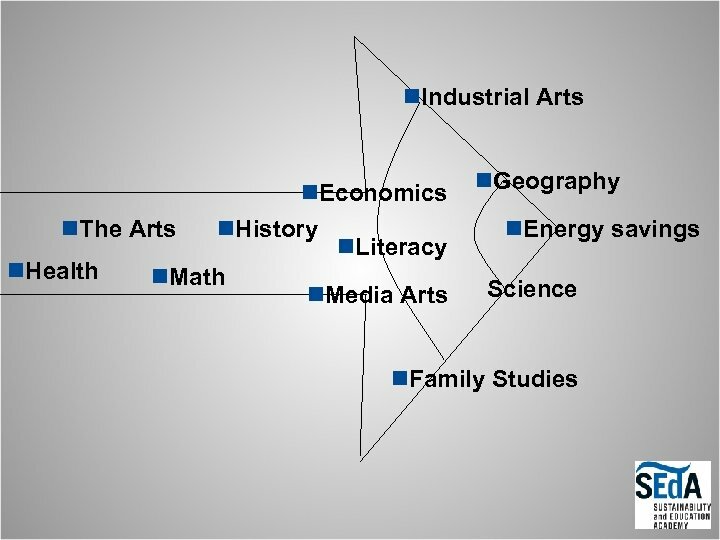 – At local, regional, and national levels. 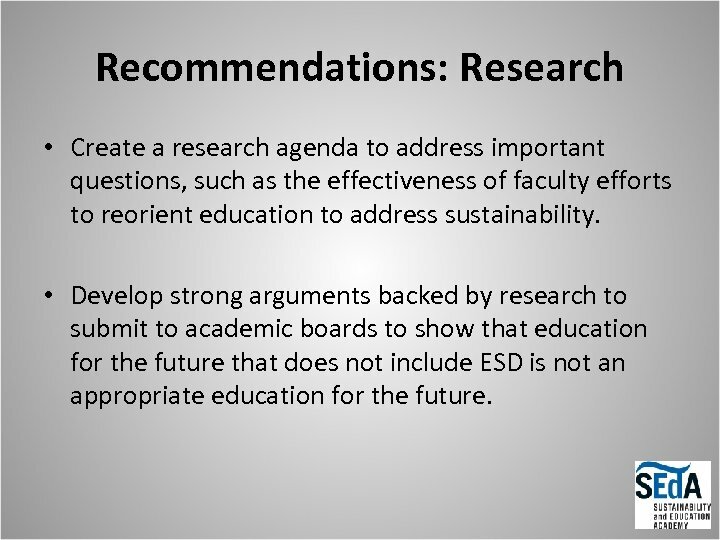 Recommendations: Research • Create a research agenda to address important questions, such as the effectiveness of faculty efforts to reorient education to address sustainability. 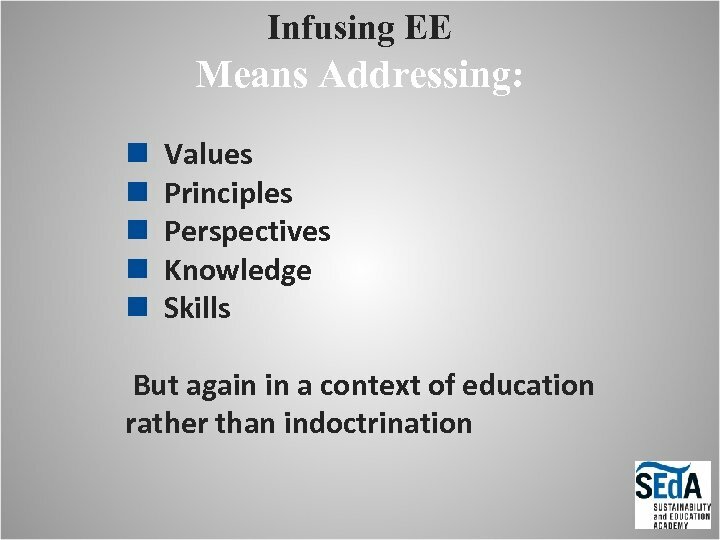 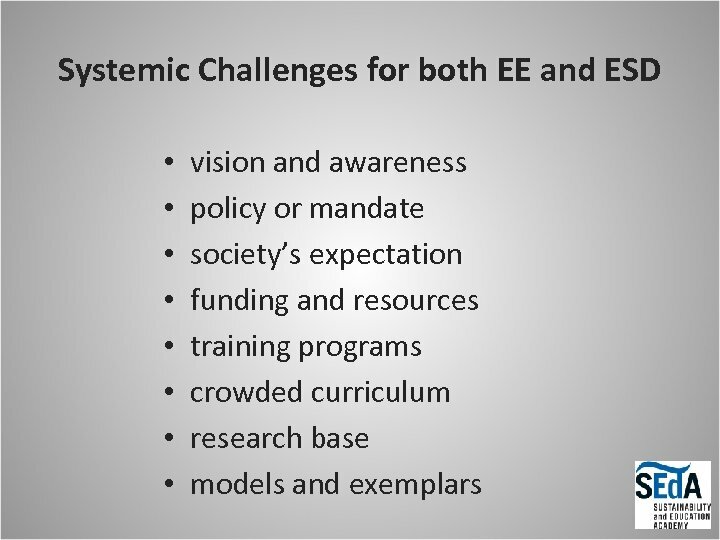 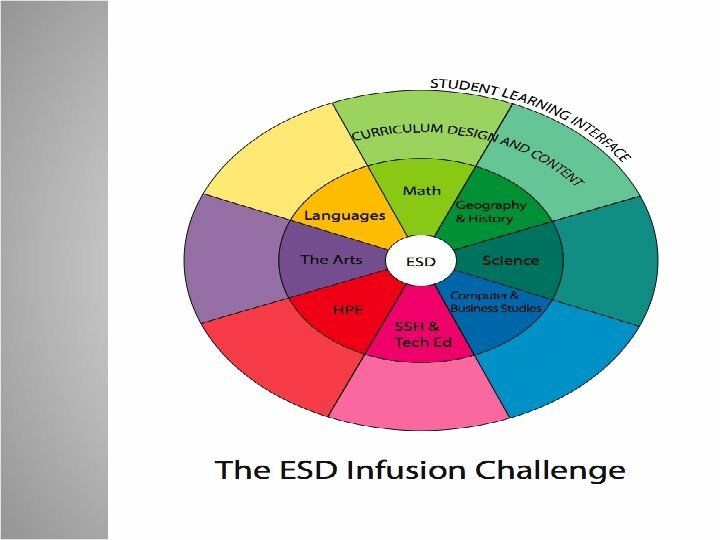 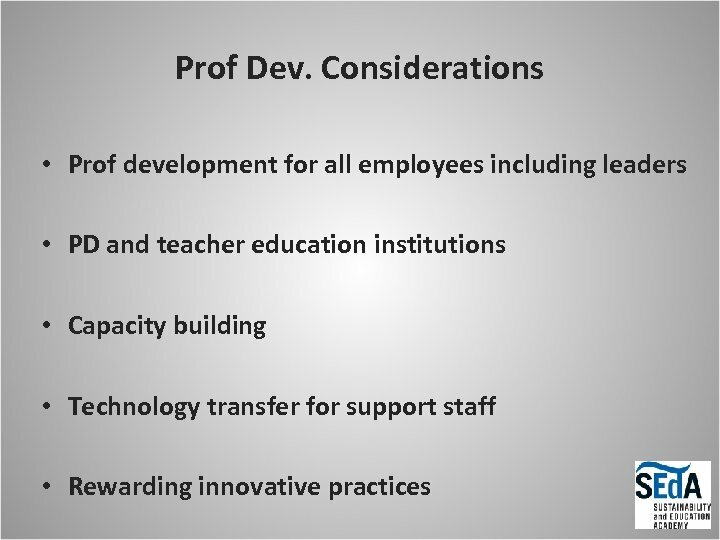 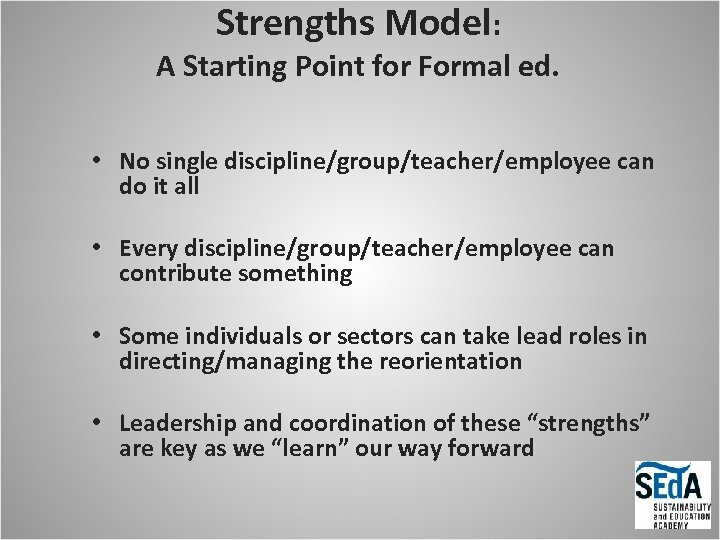 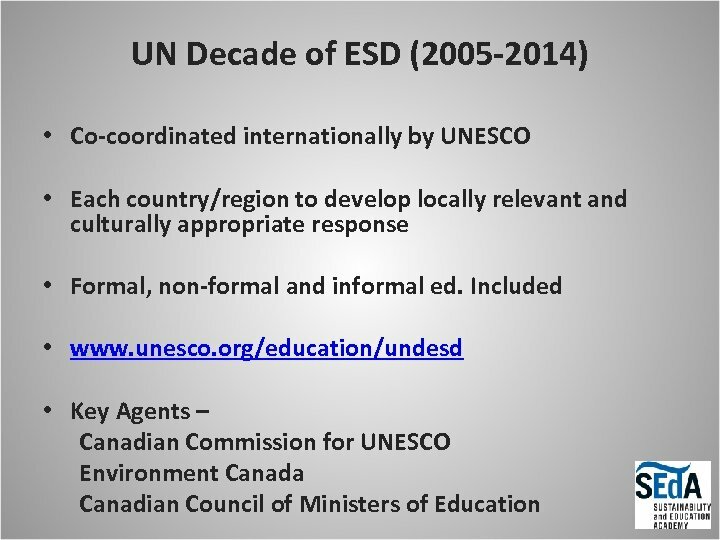 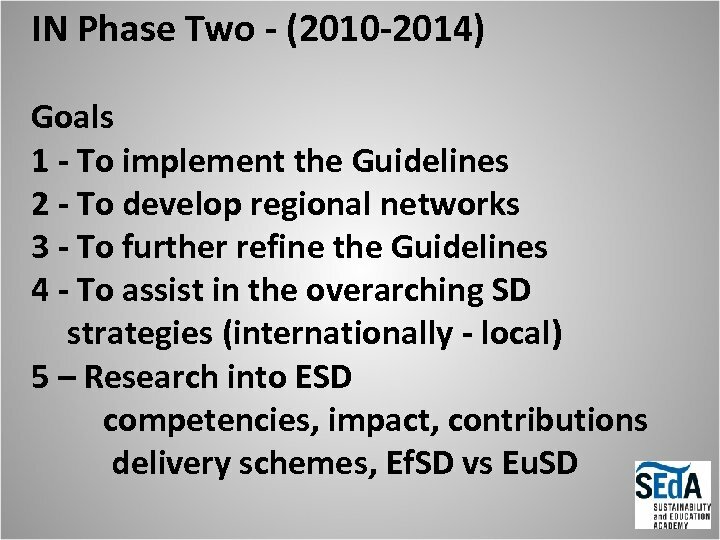 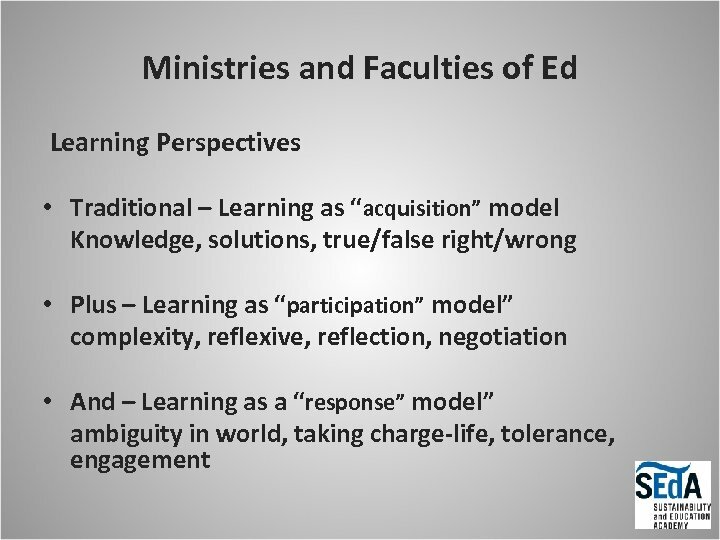 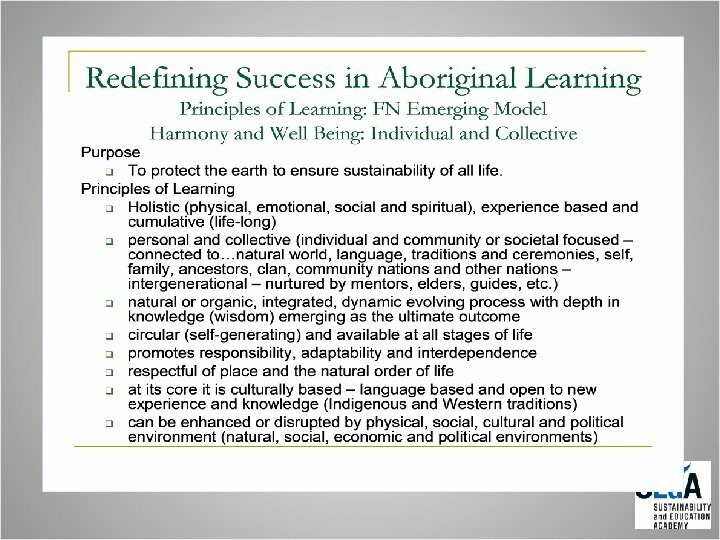 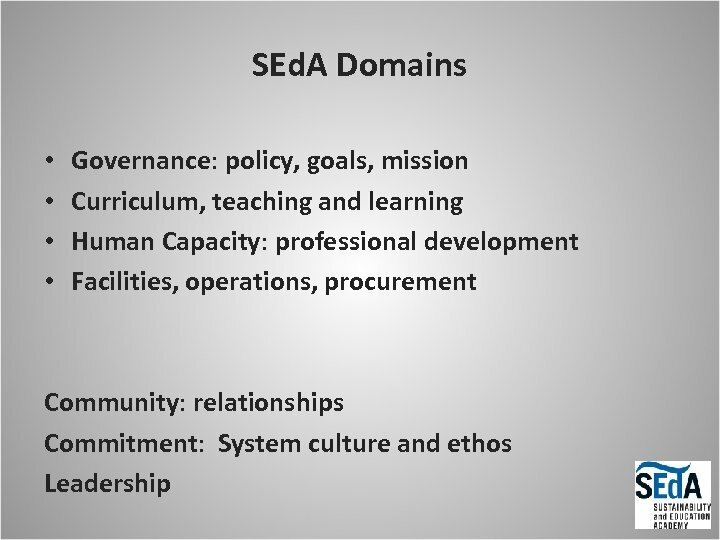 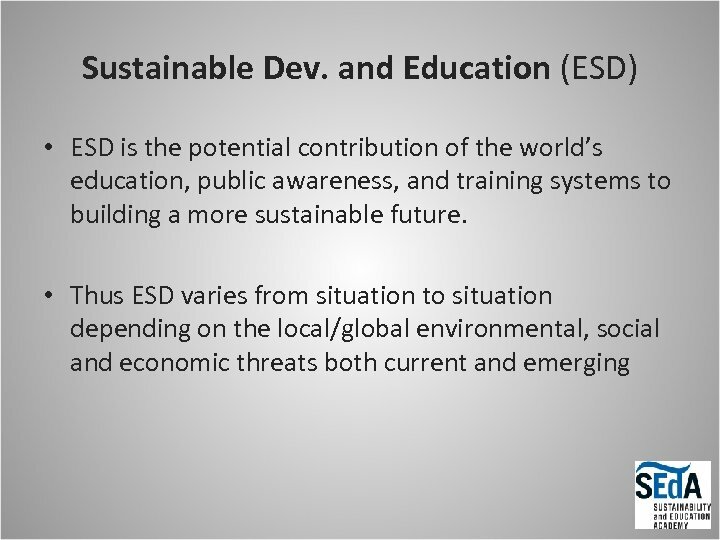 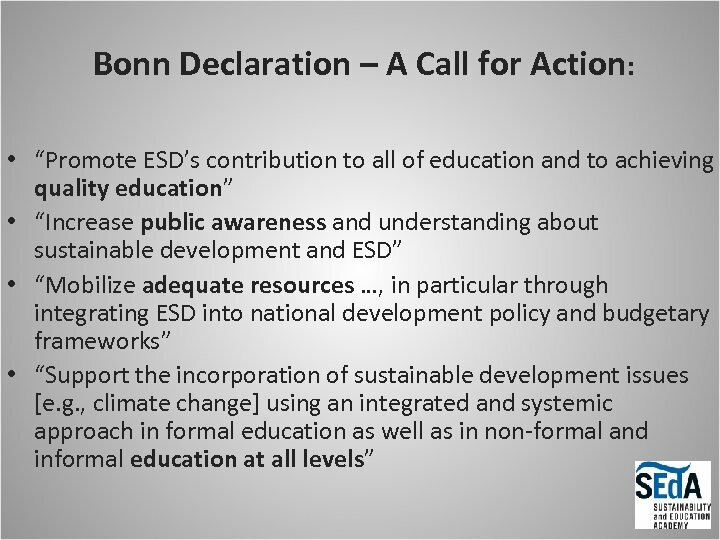 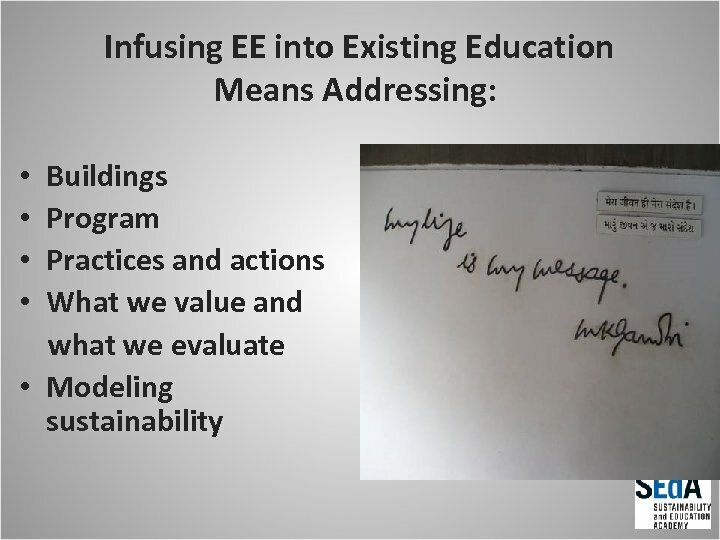 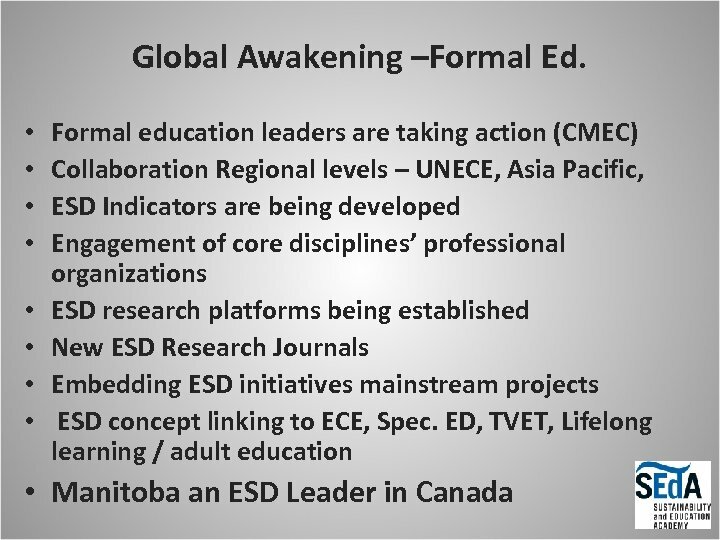 • Develop strong arguments backed by research to submit to academic boards to show that education for the future that does not include ESD is not an appropriate education for the future. 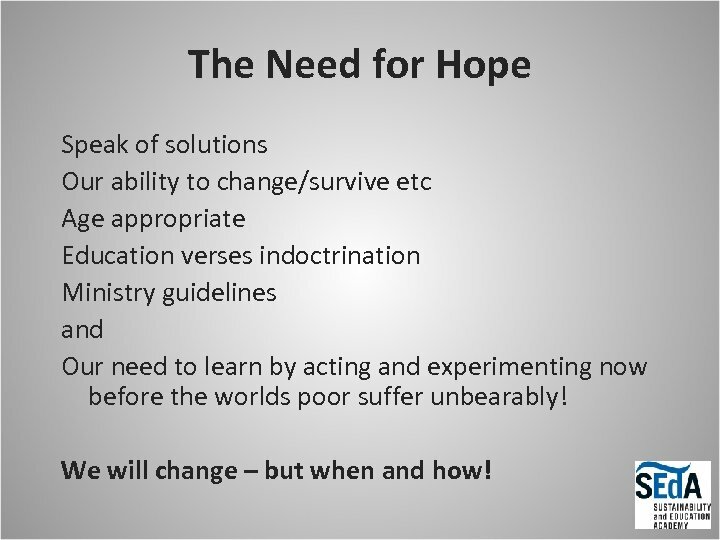 The Need for Hope Speak of solutions Our ability to change/survive etc Age appropriate Education verses indoctrination Ministry guidelines and Our need to learn by acting and experimenting now before the worlds poor suffer unbearably! 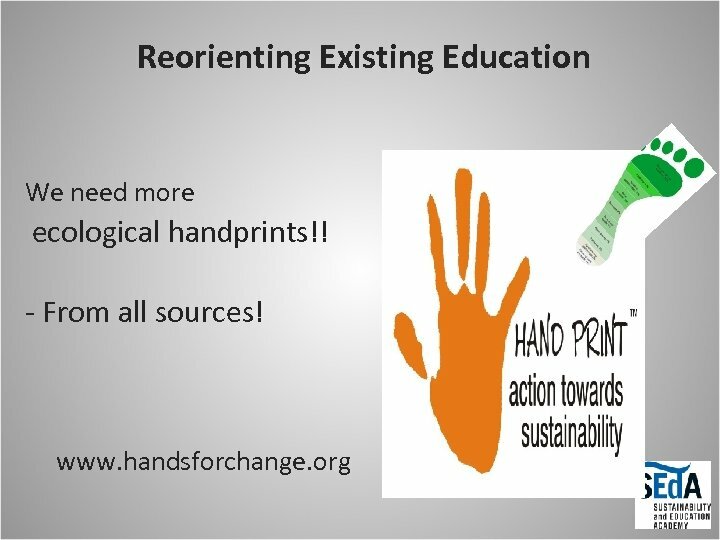 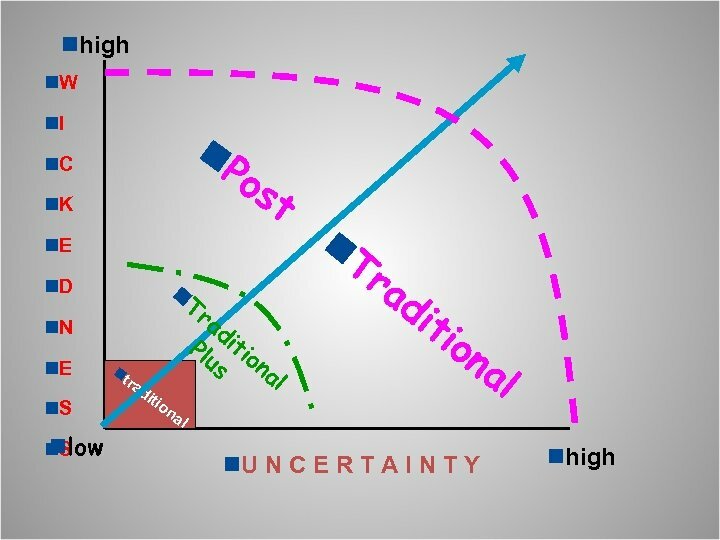 We will change – but when and how!